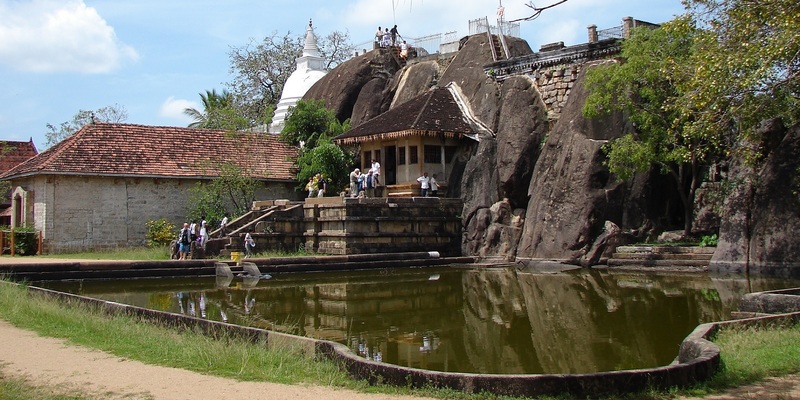 The Isurumuniya Vihara is situated between two rocks in Anuradhapura, Sri Lanka and is a beautiful temple. The temple is famous among local and foreign tourists for its carvings, Isurumuniya lovers, the image house and the wonderful surrounding with lakes, paddy fields and rocks. It is believed that the temple was initially built by king Devanampiyatissa who ruled the country from 250 – 210 B.C. and developments were done by many kings after. When kingdom was moved from Anurdhapura, the temple befell, like many others, however with the dawn of the 19th century the attention of many foreign academics was drawn to the ruins of Rajarata (Anurdhapura used to call by this name) and the area again came into prominence. The Temple is connected to a cave and above is a cliff. A small stupa is built on it during the present period. Lower down on both sides of a cleft, in a rock that appears to rise out of a pool, have been carved the figures of elephants. On the rock is carved the figure of a horse. The Temple is bordered by the Tissa Weva (Tissa Lake), a creation of king Devanampiyatissa, the Goldfish Park, Vessagiriya and paddy fields, on different sides. The one of the famous carvings in Isurumuniya temple is the Dutugamunu family which belongs to the 5th century. King Dutugamunu is one of greatest kings in Sri Lankan history. The ‘Isurumuni Lovers’ which dates from around the fifth century, is said to depict Saliya, the son of King Dutugamunu, and Asokamala, the low caste girl he married, which cost him the kingdom. Some also believe it is a soldier visiting his wife after a long spell of duty, while others believe it is Siva and Parvathi of Hindu mythology. Although it is thought that the sculpture had been brought here from another place, it is known as one of the most exquisite pieces of carving in Sri Lanka. Most of these sculptures are still on their original places in the rock face; however some of them have now been moved into a small museum within the temple. The image house, which has a reclining Buddha cut from the rock, are one of more recent construction added to the Temple.